mango recipes | Aam Indian recipes. Summer is here and so, is the season for mango! Mango, the King of fruits is available in India generally from mid-March to the end of May month. Summer are incomplete without a bowl of Aamras and some piping hot Puri. They are available in different varieties like badam, totapuri, rassiya, kesar, alphonso (hapus), laangda, rajapuri. With their intense sweetness and soft texture, mangoes are well suited to blended beverages and creamy desserts, but can also be used in savory dishes. There are also a number of health benefits of mango like they lower cholesterol, clear skin, improves digestion. Mangoes can be bought ripe which are ready to eat or unripe which have to be stored in a dry, dark place where it should be provided with some warmth for it to ripe. To check the ripeness of a mango, do not judge by its appearance but, the sweet smell and gently squeezing it to feel the softness. Once ripe, store it in a refrigerator and use within 3-4 days. Mango Falooda: Falooda is a dessert made with milk, basil seeds, falooda sev, dry fruits, ice –cream and some syrup. We have made a season special Mango Falooda using mango pulp. Mango Pancake: Make these delicious, soft Mango Thai pancake for your next breakfast which are stuffed with mangoes and coconut. Quick Mango Sandesh : Try this classic, traditional Bengali sweet recipe. This Mango Sandesh is a quick sweet and can be made in 10 minutes. Mango and Pineapple Smoothie: Relish this lip smacking, fruity smoothie made using mango and pineapple. You just have to combine the ingredients and blend to a frothy mixture. Mango and Jaggery Drink: How about an off-beat drink made using mangoes, jaggery and curd?! A luscious beverage with creamy texture and fruity flavor. Minty Mango Delight : Aam panna is a refreshing summer coolant made using unripe mangoes. Try this delightful Minty Mango Drink with a hint of mint! Instant Mango Pickle: Nothing can beat the famous combination of achaar and paratha. If you just emptied a bottle and forgot to buy one, try this instant Mango pickle recipe. Quick Mango Chunda: Chunda is a sweet pickle made using unripe mango and sugar. It is a common accompaniment for thepla. There are two basic variants of chunda, one with red chilli and one without. Methia Keri : Try your hands on this tantalizing pickle made using mustard oil and mustard seeds. Not really pungent in taste, this Methia Keri pickle tastes great with khakhra. 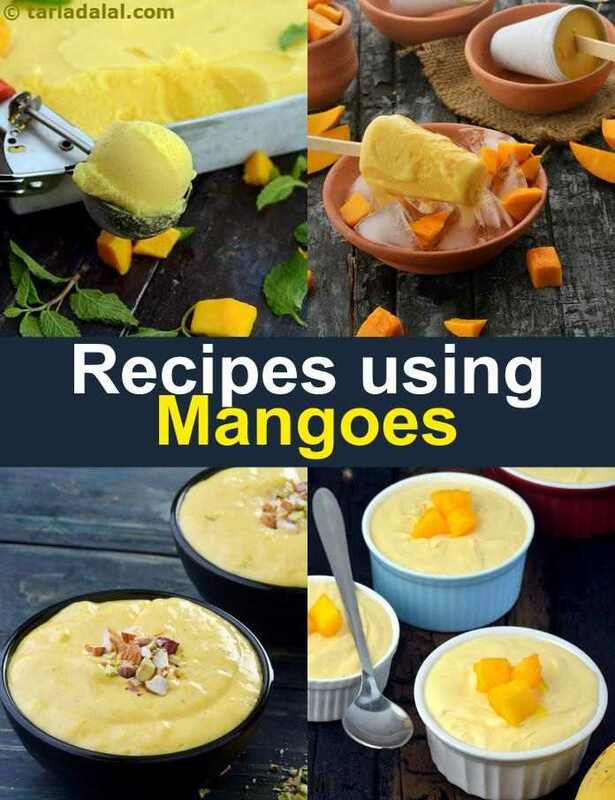 Enjoy our mango recipes | Aam Indian recipes given below.